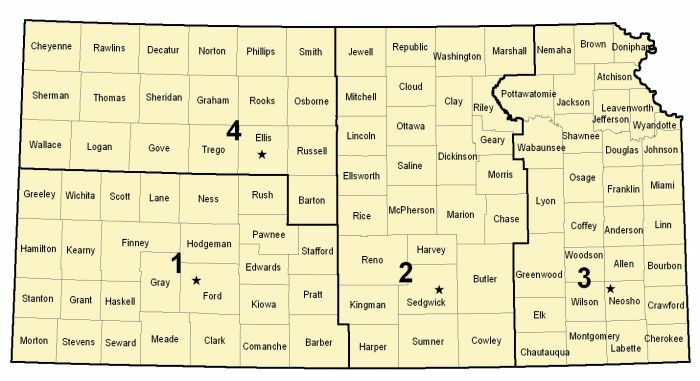 District #1 includes: Barber, Clark, Comanche, Edwards, Finney, Ford, Grant, Gray, Greeley, Hamilton, Haskell, Hodgeman, Kearny, Kiowa, Lane, Meade, Morton, Ness, Pratt, Rush, Scott, Seward, Stafford, Stanton, Stevens, and Wichita. District #2 includes: Butler, Chase, Clay, Cloud, Cowley, Dickinson, Ellsworth, Geary, Harper, Harvey, Jewell, Kingman, Lincoln, Marion, Marshall, McPherson, Mitchell, Morris, Ottawa, Reno, Republic, Rice, Riley, Saline, Sedgwick, Sumner, and Washington. District #3 includes: Allen, Anderson, Atchison, Bourbon, Brown, Chautauqua, Cherokee, Coffey, Crawford, Doniphan, Douglas, Elk, Franklin, Greenwood, Jackson, Jefferson, Johnson, Labette, Leavenworth, Linn, Lyon, Miami, Montgomery, Nemaha, Neosho, Osage, Pottawatomie, Shawnee, Wabaunsee, Wilson, Woodson, and Wyandotte. District #4 includes: Barton, Cheyenne, Decatur, Ellis, Gove, Graham, Logan, Norton, Osborne, Phillips, Rawlins, Rooks, Russell, Sheridan, Sherman, Smith, Thomas, Trego, and Wallace.